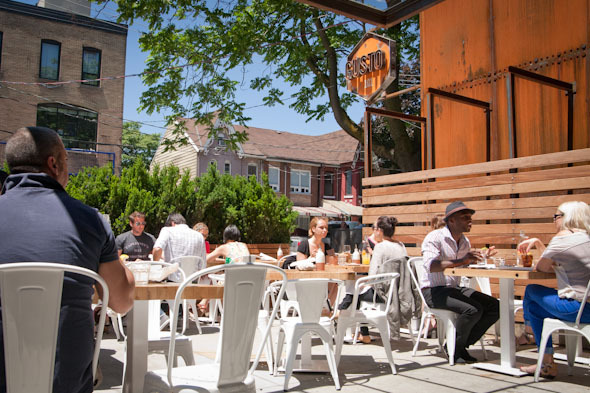 Gusto 101's patios (that's right, two patios) offer perfect settings to sip and savour the Italian Trattoria's notorious $1/oz house wine. The supremely affordable Vini di Gusto is enough to render a night in the downtown core an experience in and of itself, but enjoying a glass while literally looking down (or "out," depending on where you're sitting) on the pedestrians on Portland rounds out a truly formidable centre-of-everything outing. Almost enough to make you forget you're sitting by or atop a former auto garage. The upper patio, in particular, is still in the starting stages, but expect a little outdoor grilling to land there soon. The street level patio has been open for about a month now, offering patrons the opportunity for a little people-watching through its groomed box hedges. You'll have to squint if you want to people-watch from up top, but better to bask in the shade of its patio umbrellas and take advantage of the rooftop's own outdoor bar. Both have ultra-cool vibes with plenty of activity, surely only exacerbating Gusto 101's weekend lineups. Bring shades â both patios are uncovered. Gusto is in the process of rolling out new summer bites, which will include shrimp taco and fish kebabs. In the meantime, you can't go wrong by opting for one of the restaurant's daily specials, which include Costoletta alla Milanese and Eggplant Parmigiana. 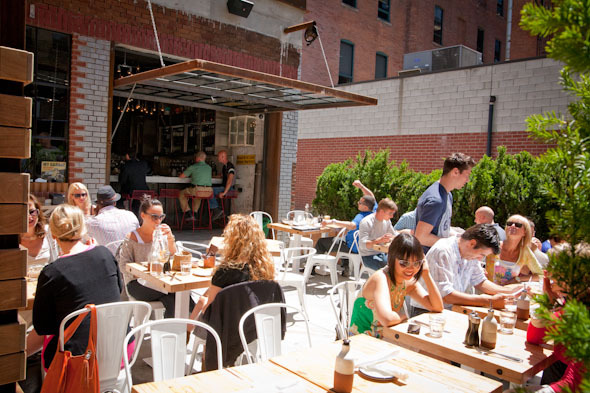 Squid ink pasta and grilled branzino for the serious eaters, but my ideal patio picks include a couple of pizzas and a pitcher of sangria to split. And speaking of, Gusto 101 offers pitchers of Sangria for $22. The $1/oz Vini di Gusto is obviously an easy call, but the restaurant also has a pretty extensive wine list that includes bottles from Ontario, Piedmont, Tuscany, and beyond. If you're keen on a Coors Light, this probably isn't your place, but non-wine-drinkers can take their pick from a list of six or seven specialty cocktails (all named after cars or motorcycles), which include the vodka-based Vespino, the Murcielago of tequila, absinthe, and ginger beer, and the Lambretta made with bourbon and maple syrup ($11-$12). The best is yet to come, says General Manager and Sommelier Matteo Floris. Matteo tells me that the rooftop patio is poised to receive a 6-foot grill that will be used for outdoor-only dining specials such as fish and meat skewers. Jealous, insiders? 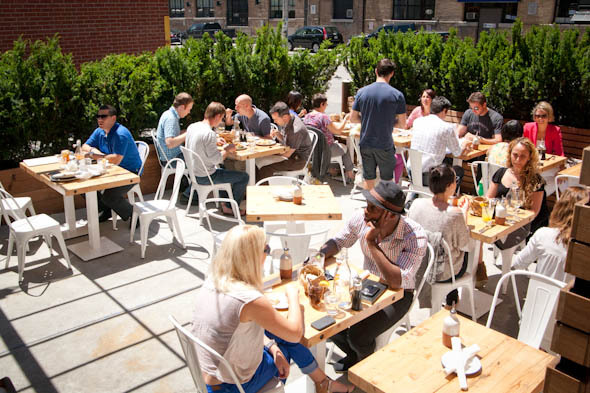 Nevertheless, you can bet on a long wait for a Saturday night banquette or table outdoor spot since Gusto 101 does not take patio reservations. 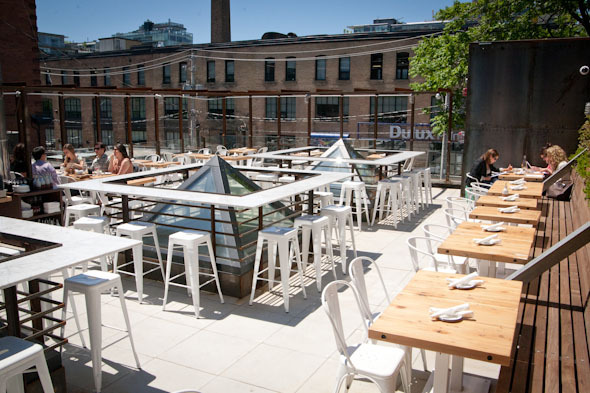 The rooftop patio is set to become an all-year patio come September when it is affixed with a retractable glass roof. That's right, "neither rain, nor snow, nor sleet..." will soon be applicable to dining at Gusto 101. Glorious, isn't it? Heat lamps will be available then and now, though let's hope that the heat continues to hold strong.